Before we left for Japan, we decided that we wanted to have at least one big, blow-out meal. A dinner that would be as much of an experience as it was a culinary delicacy There are so many bucket-list sushi shops in Tokyo but based on looking thru a myriad of reviews, prices, location and availability, we decided on "Sushi Yasuda". Chef Naomichi Yasuda is somewhat of a household name in the industry due to his relationship with renown chef Anthony Bourdain and his feature in season 2 of the show "Parts Unknown". But despite the notoriety, he hasn't changed his menu, prices or the way he serves his customers in the six years he's been back in Japan. We made our reservations a few months in advance to ensure we were able to secure a table. We decided on a late evening reservation since it opened the rest of the day up for us and felt like the perfect way to end an evening. You only have two meal options here; the "Yasuda style Omakase" and the "14 piece sushi assortment". Omakase means "a meal consisting of dishes selected by the chef". With Omakase, chef Yasuda will prepare you a daily selection based on your preferences and seasonal items. He asks you both before your arrival and at dinner if you have any allergies or food aversions. Most chefs would never ask about preferences, preferring to serve what they see as the best of their cuisine but Yasuda values people individual tastes and wants each and every person, no matter how big of a savant or newbie, to have the best culinary experience possible. The Omakase will cost you ¥12,000-¥15,000, which is rough $120, and the assortment runs ¥7800, which is around $70. One word of warning, the Omakase's price will depend on how many pieces of sushi you eat and which fish he serves. The bigger your appetite, the rarer the fish, the bigger the bill. That being said, most people will only have a meal like this once. I held back on eating towards the end of the meal as I was afraid of the price as we ate more than was original allotted, whereas Dan ate a few more pieces and the difference on the bill was extremely minimal. If you're there, just eat your heart out! You might spend an extra 50$ or so, but you'll walk away feeling like you truly had an enjoyable experience. I regret holding back...but I guess that means I'll just have to find my way back. Being the intensely apprehensive Capricorn that I am, we arrived at least 20 minutes before our reservations. The restaurant is located in the basement of a narrow building down from the subway station. As you descend the stairs you pass by a variety of candles, incense and flowers left on each step. These are commonly seen on the front steps of houses we passed on the way in and putting them here makes you feel like you're entering someone's home. The restaurant itself is a modest, zen-like space, covered in blonde wood set against soft, white walls. A few small tables encircle a large counter with seats surrounding it. There was an air of calm and quiet when we arrived, and we whispered kindly to the waitresses who took our coats and asked if we'd like a cup of tea while we waited. A few people were finishing up their meal and bowed deeply to the chefs, full of smiles as they left. Chef Yasuda greeted us with a smile as we set down and began to explain what we were in for. He asked again for our preferences, where we were front and introduced us to the other guests. It felt like a family dinner. Chef Yasuda speaks perfect English despite growing up in Japan. In 1984 he moved to NYC to start a sushi restaurant but moved back to Japan in 2011. In NYC he owned a large restaurant and with that came a lot of responsibilities. He moved back to Japan not only to escape those duties but to start up a small, sushi restaurant where things could be simpler and made the way sushi was once served. Before starting on dinner, we were offered drinks from the cocktail menu. Everything served here (aside from the cans of soda) are drinks favoured by Yasuda using ingredients from his hometown of Chiba. Yasuda is very proud of where he is from and showing off their produce is an important part of the restaurant. Dan chose Yasuda favourite sake, and I decided on a glass of cold green tea. A sweet-faced waitress came up to Dan with a tray full of brightly coloured glasses for his sake. They were each hand blown glass, and not one was the same as the other. Choosing your sake cup's design and shape is as important to the drinking of sake as the elixir itself. Yasuda starts each piece of sushi off the same way. By forming the rice. His hands work with artful precision to make each one the perfect size for the fish placed atop it. Many sushi chefs and experts will tell you that rice is 90% of what makes good sushi. Therefore finding and perfecting your rice recipe are imperative to making good sushi. Yasuda's rice is both fluffy and textured, it has a tangy bite to it from the vinegar and alone is something truly delicious. The acidity from the rice against the creamy nature of most of the fish is the perfect combo. Once Yasuda had prepared the sushi for each guest, he would place it on our plate and proceed to tell us about the piece of fish. He would details where it was caught, the history of this kind of sushi and even sometimes how the environment the fish was raised in would change the way the food would taste. Once he was done talking all that was left to do was eat it. You picked up the piece of sushi with your hands (no need for chopsticks) and have the option of dipping it in some soy sauce, but each piece is flavourful enough on its own that I don't think you need it. Yasuda loves to talk. He loves to interact with his guests and encourage people to ask questions. I asked him about his thoughts on sushi making in Japan and he talked at length about his opinions, his technique and why he left New York. He is alone behind the counter. There are no assistants, no sue chefs, no cleaners. Just him alone working on his craft. This makes his creations all the more impressive. 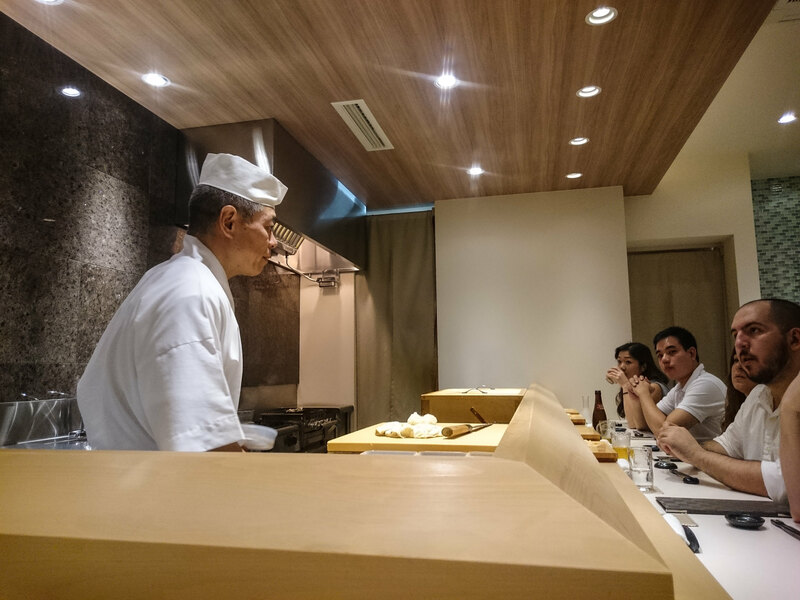 Most other sushi restaurants have a huge staff who shops, preps and helps make the actual sushi for the customer. Here, it's Yasuda alone. For my Omakase, it started off with Bluefin tuna. The perfect introductory piece of sushi. Clean and simple. Next, it was onto Norwegian Sea Bass. Yasuda makes sure to use both internationally caught fish as well as local since he wants to offer his customers the best of the best, no matter where it has been caught. After the sea bass, we moved onto the Fatty Tuna. Fatty tuna is known as being one of the most chased after types of sushi. The tuna comes in more than five different levels of fattiness. The chef's skill is shown in his preparation of the whole piece of tuna and separating it into the different cuts. "Akami" is lean part of the tuna, "chutoro" is the medium-fatty part, and the "otoro" is the highest fat cut. But even the otoro has levels of fat. There is the "kama toro" taken from the cheek and "hagashi toro" the super high-fatty tuna taken mainly from the top of the tail. Toro means "to melt", and that is exactly what this fatty part of the tuna does. Melts in your mouth. The raw shrimp was next. It was soft and rich, with a lemony finish. Horse Mackeral sushi is known to be slightly bitter and often passed over by many eaters, but Yasuda freezes the fish to "cure" it, allowing the fish to become much more enjoyable. I thought it was delightfully pleasant. Octopus has always been one of my favourite types of sushi and the one we had here was incredible. It was flavoured with lemon and topped with a splash of soy sauce. Softer and not tough or rubbery at all. A choice piece of fish. Yellowtail and needlefish were next. The needlefish was very similar to the anago (eel) we were going to have later on in the meal. It was great to try it before having the Japanese anago to compare the two. Next up was Uni - the kind of fish I was looking forward to the most. Uni is the Japanese name for the edible part of a Sea Urchin. We told Yasuda hadn't tried uni ever before but were excited to try a few varieties. Uni can come in a variety of colours, from deep gold to light yellow. The first type of uni was caught in California. It was light, sweet and briny and was intensely creamy. I was worried after all the hype, uni wouldn't live up to it all but it surpassed my expectations by a landslide. The second one we had was from Japan and Yasuda told us stories of how we went to the Tsukiji fish market every morning to make sure he found the best uni for his restaurant. This one had a much deeper flavour profile and impossibly creamy. I couldn't believe there even was anything in the world that could taste like that. It was a revelation. The woman beside us was genuinely afraid of the next dish that was served. But to me, it was absolute heaven. Salmon eggs, known as ikura in Japan, were cured by Yasuda himself and busted inside your mouth once you bit down. The ocean flavour explodes out and fills your entire mouth with the taste of the sea. It was surprisingly refreshing and perfectly salted. The Hokkaido oysters served next were unique. Hokkaido's water is freezing, resulting in a wealth of minerals deep in the ocean which is absorbed into the oysters giving them a delicious, sweet, savoury taste right out of the water. The taste was creamy and briny, these oysters we huge and every inch full of flavour. The sweet shrimp was one of the most magnificent parts of the meal and my second favourite piece of sushi of the night. The shrimp was lightly cooked giving it a slightly firm texture which brought out the bright and sweet aroma of the shellfish. Anago is the Japanese word for salt-water eels. If you get these in markets or other restaurants, they are usually doused in a sweet, cheap sauce, but here Yasuda cooked them atop a fire grill to give them a rich, smoky flavour and only lightly seasons them with sea salt, so you taste the trueness of the fish itself. We finished the meal off with salmon rolls, and snow crab and Dan had one last piece (which I regret not getting) - the sea clam. Dan said the clams were one of the most outstanding pieces of the meal. With the addition of a touch of lemon and sea salt flakes, the natural flavours of the fish were brought to the surface and was the ideal way to end the night. Although he offers us more, we couldn't eat another bite and gave in to our full bellies. Yasuda seemed satisfied with himself as we sat there, full of his excellent cooking. We thanked him kindly for such an enjoyable evening full of stories and laughter. Yasuda was kind enough to take a photo with us before we left to commemorate the evening. He flexed his biceps, he was once a famous boxer and still to this day retains those impressive muscles - which he is very proud of as well. His smile was beaming, and you can see by the look on his face how much joy that feeding us gives him. Some people have been known to be put off by Yasuda's attitude, he can be a bit cocky and judgemental of other sushi places, but he is truly a beautiful soul and cares deeply about the history and craft of Japanese sushi making. We were touched to have been able to taste a piece of his artistry and take with us the memories of those impeccable piece of sushi.